There are times when you either need to overhaul the coding of a particular song or link attribute or set up a new attribute with fresh coding. Today we’ll explore a great approach for making what might seem a tedious task easy and enjoyable. We’ll use song tempo as an example, but this process can work for any song or link attribute. Our work will be concentrated in the Library | Browse window and the Multi Song Changer. Before we dive into the details, let’s just look at some of the GSelector controls and tools we’ll be using. We’ll be frequently clicking two toolbar buttons in the Library | Browse window. 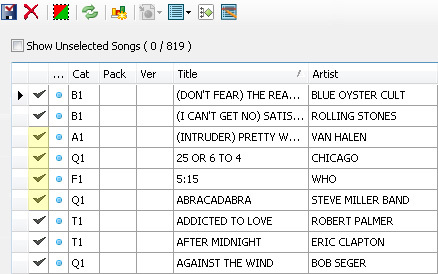 We’ll also be using the song selection buttons in the browse results pane of the Library | Browse window. A selection button is located to the left of each song and has a checkmark icon. Several selection buttons are highlighted in yellow below. In addition, we’ll be working with the Tempo control, highlighted in yellow below and located in the filter pane of Library | Browse. Let’s assume that we want to recode all of our songs for tempo. Our first step will be removing the existing tempo code from all songs. We’ll set the Saved dropdown in the Library | Browse window to [No Filter] and click the Reset Filter button to call up all of the active songs in our station. For all of the remaining steps we’ll not change the [No Filter] setting in the Saved dropdown. Next we’ll navigate to the Multi Song Changer and set the tempo control as seen below. Then we’ll click the save button to remove the tempo code from all songs. Now we’ll return to the Library | Browse window and use the song selection buttons to build a list of songs we want to code as Fast tempo. Each time we click a selection button that song disappears from view because it’s been selected. To see the list of selected songs, click the Invert button. If we select a song by mistake we simply click its song selection button in this view to send it back to the list of unselected songs. To return to the list of unselected songs we click the Invert button again. We’ll use the Invert button to switch back and forth between selected and unselected song lists to check our work as we build our list. When we finish selecting songs to code with the Fast tempo value we click the Invert button to bring that list into view. Next we navigate to the Multi Song Changer and set the Tempo control as seen here. Then we click the save button to add the Fast tempo code to the songs we selected. Next we’ll return to Library | Browse, click the Reset button to bring all songs into view, then set the Tempo filter to remove the Fast tempo songs we just coded. This makes our next pass through the unselected songs faster since there are fewer to consider. Now we’ll use the song selection buttons to build a list of songs we want to code as Medium Fast tempo. When we finish the selection process we click the Invert button to bring our Medium Fast songs into view, then we navigate to the Multi Song Changer and set the Tempo control as seen below. And once again we’ll click the save button to add the Medium Fast tempo code to the songs we selected. For the next step we head back to Library | Browse, click the Reset button to bring all songs into view, then set the Tempo filter to remove the Fast and Medium Fast songs from view. Now we have an even smaller list to work through! We repeat the list building and code application steps two more times to locate and code our Medium and Medium Slow tempo songs. After coding the Medium Slow, songs and resetting the Library | Browse window, we set the Tempo filter to show only those songs that have not been coded for Tempo. This time we do not need to build a list since we know that the remaining songs without a tempo code are the slow songs. So we jump immediately to the Multi Song Changer to add and save the Slow tempo code to the group of songs. We have coded our library of 1,000 songs in well under half an hour. Coding the entire library at once insures evenness and consistency and will certainly produce better scheduling results. Plus we had a lot of productive fun along the way!